Named for the Swiss countryside which they originated in Saanen Goats are amongst the most popular dairy goat breeds in the world today. Known for their large size and efficiency producing milk, the Saanen dairy goat was originally found only in the small Saanen Valley nestled in the midst of the Swiss Alps. In the Late 19th century several thousand goats went sent out through Europe and shortly later crossed the ocean, arriving in the United States in 1904. Slowly the goats gained popularity for their unique look, hardiness, and exceptional milk. By the mid 20th century the Saanen dairy goat had become one of the most popular goat breeds in the US and several organizations dedicated to the breed had formed including the National Saanen Breeders Association and the American Goat Society. Saanen Dairy Goats are known as the “Holstein” of the Goat world, a reference to their incredible milk production. Just like the Holstein is to dairy cattle, most commercial dairy goat operations use the Saanen almost exclusively for their milk production. Because they are able to produce an average of 2,000 pounds of milk a year, the Saanen is easily to best performer amongst all dairy goats. In addition to being great producers, Saanen Goats are well known for their calm demeanor and ease of milking. Their easy going nature also makes them a popular choice among goat showmanship competitors, who rarely have issues with the stubbornness that is more common in other breeds. The one knock on the Saanen Dairy Goat is that the butter fat content of their milk is quite a bit lower than most other dairy goat breeds. 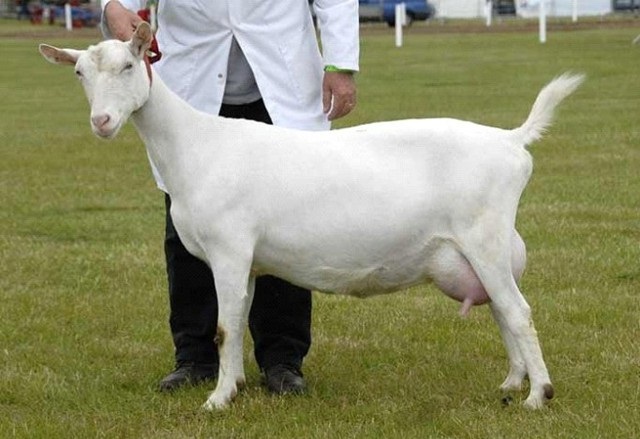 Averaging only about 2.5% – 3% butterfat content, their milk doesn’t lend its self well to cheese or soap making, like many other goat breeds do. However, their high production makes up for it in the eyes of many farmers and has kept then as the most popular Dairy goat breed in the country for the past 50 years. 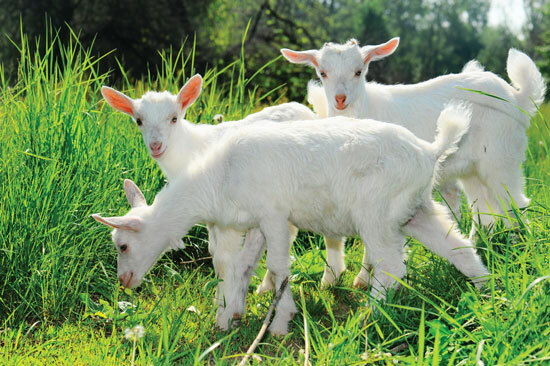 Popular amongst homesteaders, hobby farmers, and urban ranchers, the Saanen goat’s high milk production makes it a preferable choice over a dairy cow for a small operation farm. Nutrition plays a key factor in determining how successful a small farmer will be in raising a high producing dairy goat. Hay – Milking Does will need a lot of food, especially food high in protein. Add some cut and dried hay to their diet to help them remain top producers. If your hay is “sun baked” rather than “heat baked” the additional Vitamin D will help them remain healthy during the winter months. Alfalfa – in addition to Hay, a small leaf of alfalfa a day will give them additional nutrients that they need. Grains – Crushed, corn, oats, barley, and beans are all common feed supplements fed to goats twice daily. The amount you should feed will depend on the size of the goat, time of year, and whether or not the Doe is milking. However, a general rule of thumb is to feed each milking goat 2-3 pounds of hay/alfalfa and 1-1.5 pounds of grain per day. Grooming a Saanen Goat can be quite the process. Because of their white hair the Saanen can be much more difficult to groom than other breeds such as the Nigerian Dwarf Goats. Here are some simple steps to help you in the grooming process. Use a whitening shampoo and conditioner on the coat to prepare it for grooming. Leave it on for 8-12 minutes before washing it out to ensue it whitens the hair as much as possible. Rinse thoroughly to ensure all the shamppo has been washed out and ringe as much water from their coats as possible by wiping your hands from the top of their backs to their bellies. This will speed up the drying process quite a bit. Tie them so they must stand, or have a clean bed of hay for them to lay on while they dry. Finding Saanen Dairy Goats for sale isn’t as difficult as you might image. Because the breed is so popular it’s very likely that some farmers in your area have goats available for sale right now! Talk to some local farmers that you know and ask them if they have, or know anyone who has a Saanen goat for sale. Even if they don’t know anyone personally chances are that they know a “friend of a friend” who has dairy goats. This is your best bet for finding someone near you and locating your first goat. If you don’t happen to know any farmers, just head to your local country fair or livestock show and introduce yourself to some of the goat exhibitors. Let them know you are interested in trying your hand at raising Saanen Dairy Goats and ask them if they know anyone who has any for sale. An additional resource for locating a Saanen breeder is to check out the National Saanen Breeders Association website. There they have tons of information about the breed including some breeder listings. Getting into goat raising doesn’t have to be a very expensive venture. Goats can be acquired fairly cheaply and actually don’t cost a lot to feed as compared to other livestock. Goat prices fluctuated from region to region and farmer to farmer. When you are looking to buy a Saanen Goat expect to pay anywhere between $75-$500, with registered show goats going for even more. Im looking for a Pregnant Saanen for sale.